Like you can order at The Olive Garden, my friends. More often than not around here! like around the clock or something. Hmm. Real mess, hu? Not sure why a 4 year old is keeping tabs on my dirty dish status. Seems kind of odd to me. Wonder where he gets his “kind of odd” personality. I’m sure it couldn’t be from me.To read about a crazy twin-made mess click here. Anyhow! Would you like to know about this Zuppa Toscana? Oh good, I’m so glad. Let me just tell you. It was really, really good folks. All (minus 1) of my children loved it. It was a hit. That, is something to be grateful for! Hope you love it as well! 1. In a large soup pot brown up your sausage with the red pepper flakes. 2. While the sausage is cooking, slice up your potatoes. Nice and thin, now. 3. Then quarter the slices. 4. Chop up your onions, and mince your garlic. 5. Once the sausage is cooked remove it to a plate, and pour your onions, garlic and bacon into the soup pot. Saute them, stirring frequently until the onions are transparent. 6. Add the broth and water to the soup pot. 7. Carefully pour in your potatoes. Bring the soup to a boil. Reduce the heat to a simmer and let the potatoes cook. Should only take about 10 minutes. 8. While your taters are cooking wash up your Kale. This lovely image above is Kale. I have to admit, when I read the original recipe I though. “Kale? What in the world is Kale? Is that some kind of bird without the U sound in its name?” Don’t tell anyone how exceedingly lame I am, ok? Thanks. ‘Precieate it. Kale, my friends is a thick leafy vegetable that can be found in a regular grocery store in the produce section. Easy. Much easier than finding Quail, as far as I can tail tell. Roughly chop up your Kale into small pieces. and the Italian Sausage. Cook the soup just until it is heated through. 10. Add your Kale, remove from the heat and serve. I posted earlier in the week. May your dirty dishes be few. I LOOOOVE this soup!!!! I've made it before and it came out wonderful!!!!!!!!! Jamie, Jamie, Jamie, I can NOT WAIT to make this soup I made it once before and used kale it was my first time and wasn't sure about it either but, it totally makes the soup. We are going to Sun River Oregon for a week in the snow and I believe this soup just moved up to the top of my menu!!! so glad you have pictures step-by-step. I'm a dumby when it comes to cooking. Nicole, you’re so right. It’s nice to have a healthy aiodctdin (besides the occasional double chocolate brownie!). Funny how a simple vinaigrette can transform such a healthy green, but I’m definitely hooked, too. That soup looks delicious Jamie. I love just about anything Olive Garden. Can you believe I have never cooked with Kale. I really need to change that. Ooooh! This is by far my absolute favorite soup from Olive Garden! I was thinking the OG version had spinach instead of kale…I learn something new everyday…like, I never knew that I even liked Kale. LOL Thanks for sharing the recipe. This is going on my menu plan for the weekend! You can also use Swiss Chard instead of Kale in this soup. When I saw your post for the breadsticks, I immediately got a craving for the Zuppos Toscana soup. Thanks for being a mind reader!! I loved this soup! Hubby thought it was a bit spicy..
Maybe next time I'll use alittle less red pepper flakes to satisfy him! Kale is one of my alllll time favorite vegetables! This soup looks very good. Kale is so good for us too! Hi, I actually made this soup a couple of weeks ago however, when I put the sausage back into the soup it made my soup all greasy and red. Do you hae any helpful tips for that. It was still delicious I just don't know why it went red. I LOVE Kale! I went grocery shopping today and made sure to buy all the ingredients for this soup, it looks so delicious! Can't wait to try it out this week! I really liked this soup. My kids thought it was to spicy. Is it the red pepper flakes or the Italian sausage? I love love your blog and the step by step instructions. So glad you liked it! I would check to see what kind of Italian Sausage you are using. They usually come in mild and hot. Also, leaving out the red pepper flakes would help as well. If you have kids who don't like the heat I would choose the mild sausage and then leave the red pepper flakes out. Good luck! Yum! 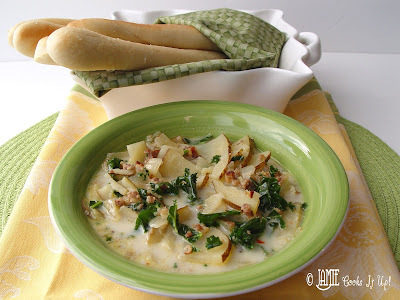 I have been making Zuppa Toscana for about 10 years and it is my families favorite soup recipe. Mine is very similar to yours, although I like to use either Jimmy Dean Hot breakfast sausage, or Hormel Spicy Breakfast sausage (which is even hotter). Your breadsticks look GREAT. I have been experimenting with a couple of recipes for Olive Garden Copycat breadsticks, but I haven't been happy. Can't wait to try yours soon! Making this tonight for some company for the umpteenth time and I LOVE it along with the Olive Garden Breadsticks. Thank you so much!!!!! Could you use spinach instead of Kale? Kale is a lot more hearty than spinach, so it keeps its shape nicely when added to the hot soup. Spinach will wilt quickly and leave you with a lot of soggy greens in your soup. Hope this helps. Can you tell me what chopping tool you are using in these photos? What brand, where did you buy it, do you like it, does it work well, etc. Thanks. Your recipes are great and have helped me greatly. Any chance of copying Zupas chicken enchilada soup? The knife in the pictures is part of the Ronco 25 Piece 6 Star Knife Set. You can purchase them at this link. I love these knives. Couldn’t get along without them. I use the knife in the picture most often. I made with this without adding water. Delish! I made this for bunco, and it was a hit! Your son Mark is so handsome, what a great smile! I started making this soup a few years ago and it was also my first time using kale. Since then we have learned to love it and I add it to so many things. My youngest children won’t eat green vegetables, but I blend a bunch of Kale in their strawberry banana smoothies and they never know. It is so good for us so I love using it whenever I can. A couple of variations I do with the soup which are step savers are to use chopped frozen potatoes and Jimmy Dean Turkey Sausage Crumbles (a lot less fattening). I love your recipes! Have you tried this soup in a crock pot? Adding everything except the kale and half and half? I’m trying it today. I hope it works out. Will it make my sausage a spongy texture? I am making this tonight for dinner. How long can you keep this as I will have several groups coming different times. How long can you keep this soup hot. I have several different people coming at different times. Would you just keep it warm? I’ve made this soup at least 5 times and it is ALWAYS delicious. My friends are obsessed with it too! I doubled the potatoes (just because I had them) and it still came out perfect. Thank you for sharing this wonderful recipe! So happy to hear you have been enjoying this recipe. It’s one of our favorites as well.